Foam Buster, our best foam-fighting technology, is a blend of specialized proteins, free amino acids, and micronutrients which stimulate the floc-forming bacteria to degrade grease, emulsions, and petroleum hydrocarbon-based products and enable the bacteria to outcompete the filaments which cause foaming. Foaming filaments like Nocardia, Gordonia amare, and Microthrix parvicella use the fat, oil, and grease as well as their fatty acid by-products to produce a buoyant fatty cell wall. Foam Buster provides the naturally occurring bacteria a chance to compete. Foam Buster is effective in the oxidation ditches, activated sludge plants, SBRs, extended aeration waste water treatment plants, and aerobic digestors. All these areas can be infiltrated by Foam-causing, F.O.G.-hungry filaments like Microthrix Parvicella, Nocardia, and Type 1863. Foam Buster also works well on the bulking filaments Type 021N and Type 0092. Foam Buster’s control of these filaments can be supported by heavy wasting programs and Qwik-Zyme L, a biocatalyst that specifically attacks the fats, oil, grease, and fatty acids that filaments use for food. Most bacteria in wastewater plants are unmotivated and listless. 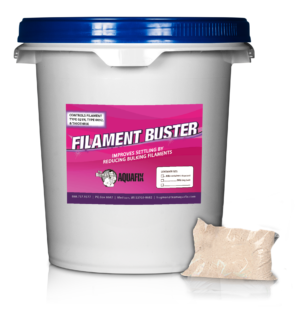 Part of Foam Buster’s micronutrient blend is formulated to give the filament-degrading bacteria extra boosts of energy that allow them to degrade the filaments faster than they can reproduce and get rid of the foam. 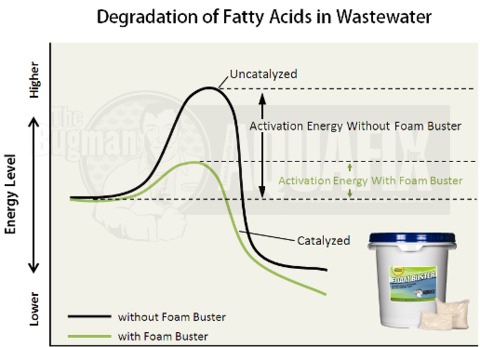 As the graph shows, Foam Buster allows wastewater bacteria to degrade filaments while contributing a much lower amount of their own energy. But Foam Buster supports filament degradation in more ways than energy. Its formula also contains nutrients specifically needed by the bacteria to create certain foam-busting biocatalysts. A bacon grease molecule is different from a butter molecule is different from a filament molecule, and Foam Buster provides the right array of micronutrient ingredients to allow the bacteria to produce the specialized recipes for biocatalysts to attack these different molecules. Foam Buster also contains minerals, surface-tension depressants, and natural buffering systems, all of which work together to rid your plant of surfactant and emulsion chemistries as well as F.O.G. and fatty acids. A lot of times when a wastewater plant gets foam they will use a chemical defoamer or an anti-foam to knock the foam down. Chemical defoamers work by covering up the problem for a period of time. In addition chemical defoamers can cause sludge bulking issues, nitrifier toxicity, and are limited in that they do not control Nocardia or surfactant foams. Silicone anti-foams break down into siloxanes which corrode combustion engines. Neither type of product truly addresses the root cause of the problem. Foam Buster addresses the cause of the foam and provides bacteria with the tools they need to digest and break it up. And because you never know when an influx of grease or surfactants can hit, Foam Buster has a maintenance dose to keep your bacteria crisis-ready and we offer DeFoam 3000, which is an organic defoamer that is easy on the biology and functions as a fast-acting temporary fix. For especially tough issues, use the synergistic combination of Foam Buster and Qwik-Zyme L. Qwik-Zyme L helps to get the grease under control while Foam Buster alters the bacteria populations so the foam will not return. A municipal wastewater operator was called down to the plant at 1 a.m. on a Saturday to find 6 feet of foam on the basins. A company had rinsed out 5 gallons of surfactant out of an old barrel with no idea how it was going to foam in the wastewater plant. The company apologized, only to repeat the same mistake six months later. This time the plant knew the culprit. 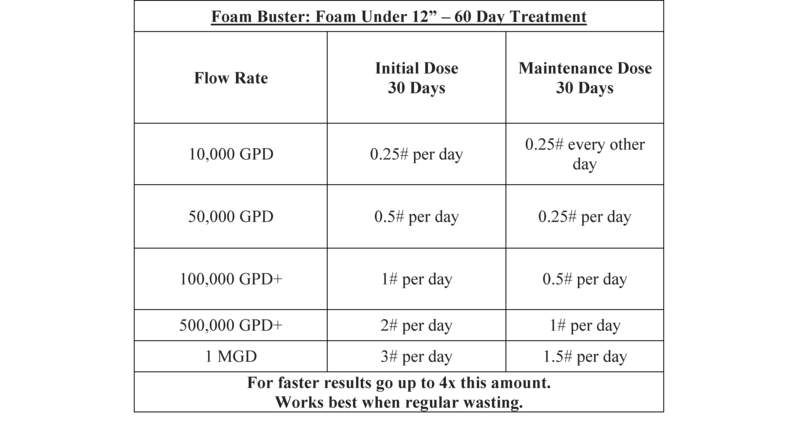 A member of the Fox Valley Operator Association has an activated sludge plant in Northeastern IL and was having issues with Microthrix Parvicella. A wastewater treatment plant on the south side of Chicago had an extensive foaming issue caused by the Nocardia filament. All the aeration basins were completely covered, and the foam even found it’s way into the center walls of the clarifier. In addition to the foaming, the plant received exceptionally high spikes of ammonia during the weekends. These spikes would reach up to 60 ppm. The operators began applying Foam Buster and Qwik-Zyme L to improve the cold weather degradation of surfactants, grease, and long-chain fatty acids, all which are nutrients for Nocardia. 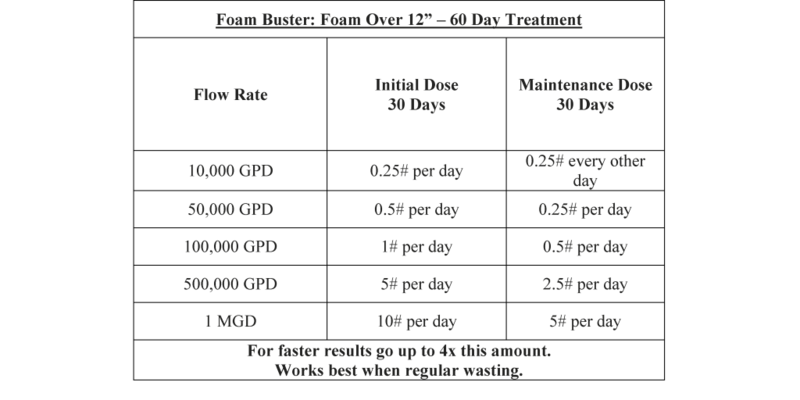 By the 30th day of the application, the foam cleared up to 75%. The operators continued a maintenance application to fully clear the plant. By fully degrading the grease and fatty acids, more ammonia and nitrogen was consumed, thus stabilizing the weekend ammonia spikes. This plant’s operator got a tip from a nearby neighbor about suspicious activity, after putting two and two together the operator notified the authorities. It turns out, in this nice community, a resident was producing methamphetamine. As soon as this meth lab was shut down, the wastewater plant stop receiving ammonia spikes. Aquafix is able to help out with spikes, but the production of methamphetamine will send very high amounts of ammonia and other chemicals to your plant. It is unfortunate, but highly important to keep a watchful eye. A wastewater plant in Western Pennsylvania has a flow rate of 3 million gallons per day. During the winter months they routinely encounter problems with foam. March 1, 2011 they began adding 20 lb. of Foam Buster per day. 3 weeks later: The foam was gone and the temperature of the aeration basins was 75°F. Add 2# – 3# Foam Buster to help with the foam and add 1 gallon of Qwik-Zyme P to improve settling.